Australia is a wild and beautiful place, whose color palette of red outback sands and hues of green envelope the trees, shaping a picture perfect landscape, with great weather, and animating wildlife creatures. Bubble Tent Australia offers guests a chance at spotting a kangaroo hopping by, watching the sunrise over the second largest canyon in the world, encountering a cockatoo flying by or simply taking in the breathtaking view right before your eyes. 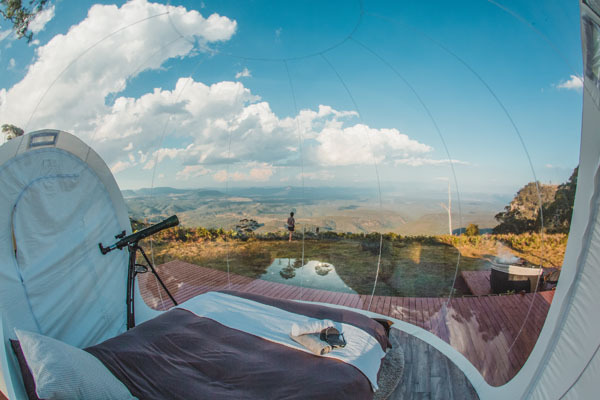 Bubble Tent Australia takes glamping to a whole new level with their luxury glamping hotel, situated 3 hours outside of Sydney, on a farm between Lithgow and Mudgee, overlooking Capertee Valley. Visitors can go off-grid without worrying about insects, rain, wind or any other troublesome natural element you would expect when you go off-grid camping. Each bubble tent is equipped with a comfortable queen bed with goose down pillows and blanket cache, a telescope for stargazing, working bathroom with compost toilet and sink with pump water, UE wonder boom Bluetooth speaker, headlamps, cooler, USB charger, slippers, towels, hot water bottles, raincoats, eye masks, crockery, champagne flutes and an iPad complete with stargazing apps, birdwatching apps and curated Spotify playlists. Guests can sit back, relax, sip on a glass of wine and comprehend the incredible view, including the occasional sheep that walk on by on their way up the hill. Pick up an antipasto platter with cheese, and a bottle of Mudgee’s leading wine, for a charming evening, before munching on skewers cooked over a fire. There are 3 bubble tents to choose from, each with different views and their own unique characteristics. 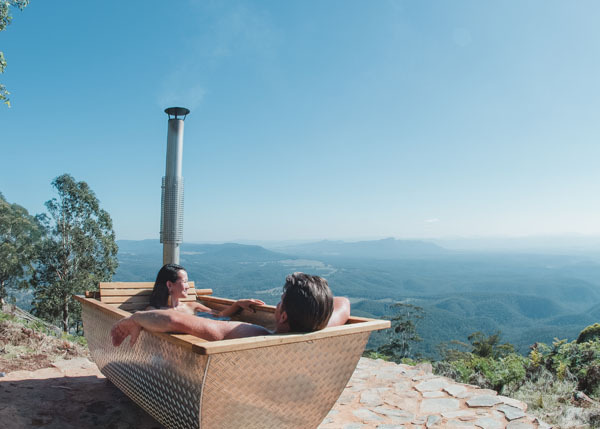 Virgo allows guests to marvel at the panoramic views of Capertee Valley, and includes a warm wood-fired hot tub and a watering can rinse shower. Virgo is furnished with a deck, camping chairs, a day bed for cozying up to a loved one and an umbrella to keep Australia’s sun rays from blazing down on you. Leo stands proud on a rolling hill with one of the highest points in the entire valley and includes a hammock higher up the mountain nestled between two trees and offers the best views of the valley and Cancer is tucked neatly on top of towering cliffs and is a dream come true for outdoor enthusiasts. When the sun disappears behind the mountains, the night sky reveals itself, and stargazing is impeccable for this location. 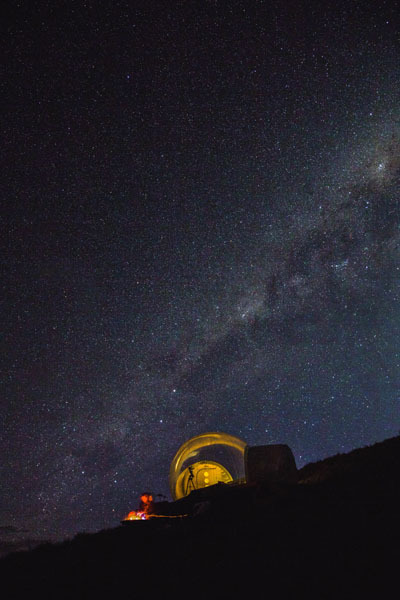 The 360-degree view allows you to absorb the magic of the blanket of stars. There is a telescope in the tent useful for getting a close-up view of the moon and the Spotify playlist helps set a romantic tone, for a starry-eyed night with your companion. When the sun rises, there are many activities around. Located within an hour’s drive, visitors can taste Mudgee’s finest wines with over 40 cellar doors, and organized tours available. 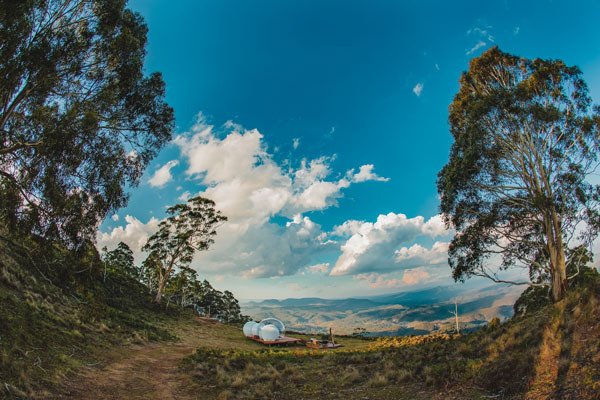 There is numerous trekking, hiking and abseiling spots, including fishing spots and water activities at Lake Lyell, or opt in for a helicopter tour over the valley and be amazed at what Australia has to offer.